Got cold feet? The winter season can have an effect on even the best-kept feet. There are a variety of factors that can affect the health of your feet and toenails in the winter. Fortunately, there’s several things which you can do and keep in mind in order to keep your feet healthy all year long! The cold and dampness that accompany the winter season can decrease the blood circulation in your feet. Additionally, shoes that are too tight or uncomfortable may pinch your toes and further the issue. 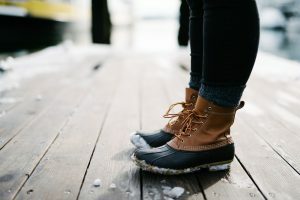 Make sure that your winter shoes or boots are warm, waterproof, and comfortable. Many of us wear thick, cozy socks to keep our feet warm and it’s easy to forget this when buying shoes! Be sure that your footwear is roomy enough to allow your feet to breathe. Wet snow, puddles, and frosty grass can all pose the risk of wet shoes and feet. If moisture accumulates between your socks and feet, and between your toes, bacteria or fungus may take advantage of the damp environment and begin to grow. If, when you take your shoes and socks off and notice pale patches on your feet, particularly the ball and heel, these areas have gotten wet and are retaining moisture. If you do come across a wet environment, be sure to remove damp socks as soon as possible. The cold weather wreaks havoc on feet, and using dry heat from a space heater or fireplace can cause the skin to crack. After you bathe, be sure to moisturize your feet to minimize any potential dryness or cracking, and apply mininally in the spaces between the toes. This goes for the rest of your body as well; dry winter skin can affect you anywhere! Overly long toenails pose an issue when wearing closed-toed shoes on a daily basis. Trim them regularly to avoid discomfort or other issues. If you notice your toenails becoming thick, crumbly, or discolored, they may have a fungal or bacterial issue and you should seek medical treatment. Wet socks and moisture accumulation are major causal factors in developing toenail fungus. If you notice any unusual symptoms in your feet, it’s important to schedule an appointment with us. Call us today at (281) 469-2676!